Enjoy reading about places beyond the usual tourist trail? Interested in the rich diversity of cultures that make Europe so special? Then you will like hidden europe magazine! Subscribe online via our online shop. hidden europe is published three times a year: in mid-March (spring), mid-July (summer) and mid-November (winter). A one year subscription (3 issues) costs € 23 / £ 21 (within Europe) or € 26 (rest of the world). These prices include shipping costs (airmail) and all necessary sales taxes (7% VAT for EU customers). And why not take out a gift subscription for a friend? Should you find that hidden europe magazine is not for you after all, just contact us to cancel your subscription and we shall happily refund the costs for any unsent issues. No questions asked! So why not give it a try and order hidden europe today? The price for each set is: € 21 / £ 19 (within Europe) or € 24.50 (rest of the world) inclusive of shipping costs and taxes. For details on which issues are included in each set, see our online shop. Of course these prices are inclusive of shipping costs and all necessary sales taxes (where applicable). 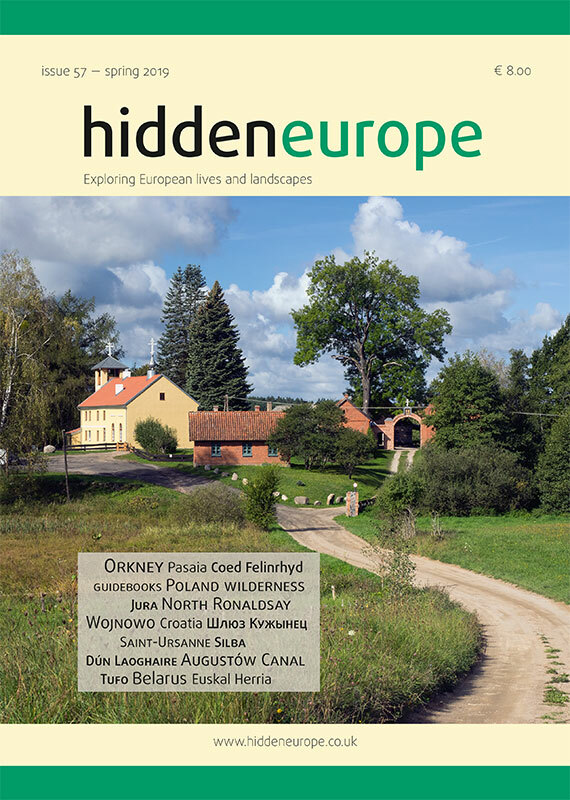 Although hidden europe is usually purchased on a regular subscription basis, we also make provision for those who just want to buy a single copy. Prices for a recent single issue are € 8 / £ 7 (within Europe) or € 9 (rest of the world). Earlier back issues are € 7 / £ 6.50 (within Europe) or € 8 (rest of the world). Just place your order at our online shop (opens in a new window). Alternatively you can call us on 0049 (0)30 755 16 128 (weekdays between 9.00 and 18.00 CET) or send us a fax on 0049 (0)30 715 22 870. Please note that hidden europe can only be purchased directly from us. We prefer to have direct contact with our customers. The overheads imposed by high street retailers would more than double the cost of hidden europe. So we prefer to take your orders personally or via our online shop. We accept payments in pounds sterling and Euros and you can pay by credit card (VISA, VISA Debit, Mastercard/Eurocard, Laser, AMEX), by cheque (for UK customers), by direct bank transfer (for German and UK customers) or by international bank transfer (IBAN and BIC). If you have any questions about payment options and procedures, please contact us at via our online contact form or browse the frequently asked questions. hidden europe is a completely independent, advertising-free publication.